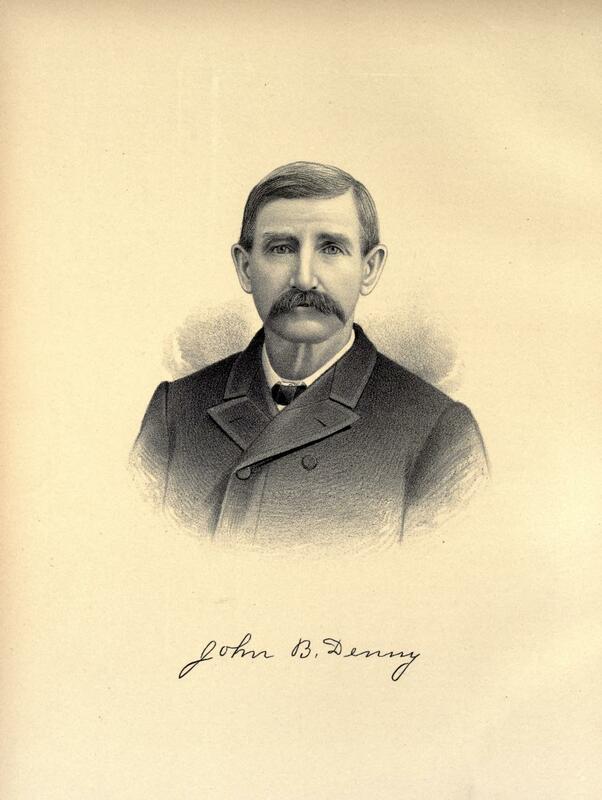 JOHN B. DENNY. After meeting the genial and open-hearted gentleman whose name adorns this page, a stranger would soon discern that he is a descendant of that race to whom wit and humor are as natural as the breath they draw. Mr. Denny is a farmer living near Sorento, but to him the calling which is to so many a weariness and drudgery is enlivened by versatile -humor and a sanguine disposition. Beside his farming operations, he holds the position of Treasurer of the Sorento Coal Company. It is a notable fact that the majority of the prominent citizens in and about Sorento are natives of this locality, and our subject is no exception to what is the -general rule. Mr. Denny was born within half a mile of his present place of residence, his natal day being May 3, 1839. He is a son of Robert W. and Eleanor (Finley) Denny. Elsewhere in this volume, in the sketch of I. H. Denny, mention has been made of the ancestry and various movements of our subject's parents, hence we will confine ourselves to his individual history, merely stating that Robert W. Denny died about 1845, and that his wife survived until 1889, finally passing away in Kansas, at the ripe old age of eighty years. J. B. Denny grew to manhood's estate, receiving mainly the training of a farmer's boy. He had acquired a very good education for his day, and at the age of nineteen years began to teach school, devoting himself to his teaching in the winter and to farming in the summer. July 7, 1861, he went into the army, joining Company E, of the First Illinois Cavalry. As a private he was in the siege of Lexington, and was slightly wounded in the right hand. He was also taken prisoner, but was paroled, and while enjoying this hampered freedom was discharged from the service. January 6, 1862, our subject was united in marriage with Miss Olive Dressor, who was born in Bond County. She was a daughter of Rufus and Tamar (Cothren) Dressor, a family of English extraction. Mrs. Denny's great-grandfather came from the Old Country at an early date and settled in Massachusetts, where her grandfather was born. The old Bay State was also the birthplace of her father, Rufus Dressor, whose natal day was July 29, 1795. He went to Maine when a young man and there married Tamar Cothren, a lady of Scotch-English extraction, though a native of the Pine Tree State, her birth having occurred February 12, 1797. Her parents made the trip from Maine to Illinois, taking the overland route, in 1837, and her father died in this county October 13, 1858. The mother survived until July 17, 1880, when she passed away at the advanced age of eighty-three years. In 1864, Mr. Denny brought his family to the place where he now lives, and which immediately adjoins the farm where his father settled on first coming to the State. Here he has been extensively engaged in farming and stock- raising. He was one of the parties most instrumental in developing the Sorento coal mines, and is now and has for many years been the Treasurer of that company. In early life he served for four years as Justice of the Peace, and has been many times identified with the school interests. In his party preference he is a Republican. He is devoted to the interests of the Grand Army of the Republic, and for three years was Commander of the post at Sorento. There have been three children born to Mr. and Mrs. Denny. Of these Elizabeth is the wife of Charles Gordinier, a native of Indiana, and one of the stockholders in the Sorento coal mine. Mary Ellen is the wife of J. F. Harris, a young attorney at Sorento. John Oren is a student at the Southern Illinois College, of Enfield, this State. Mr. Denny does not actively operate his farm to any great extent, leaving it to the charge, for the most part, of responsible parties who carry out his instructions. His time is mostly given to the development of the coal interests and other financial enterprises on foot in Sorento and locality. Mr. Denny was one of the three who acted as Commissioner in assessing the value of the condemned right of way at the time the first railroad, the Vandalia Line, was run through the county. He was also Census Enumerator for Short Creek Township in 1880 and 1890. 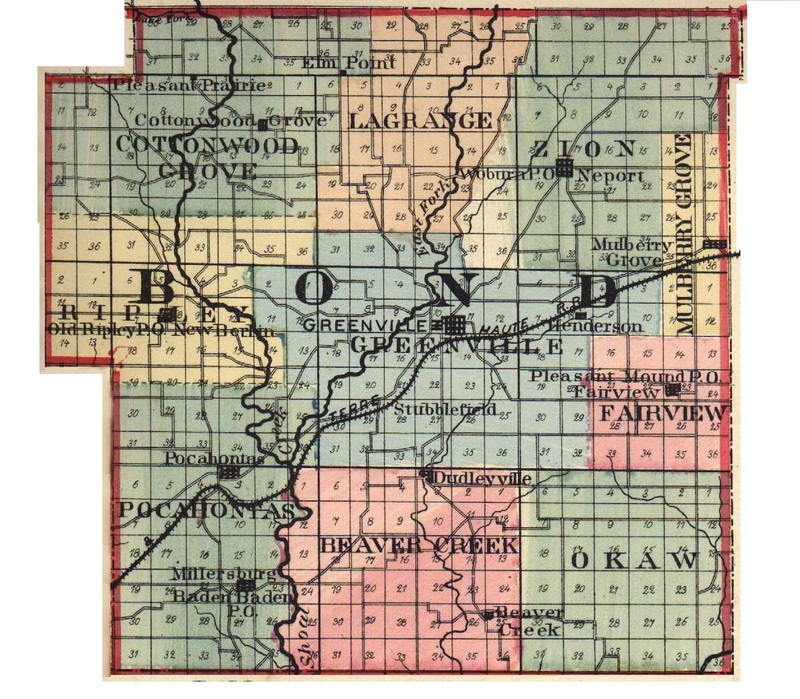 Extracted 04 Dec 2016 by Norma Hass from 1892 Portrait and Biographical Record of Montgomery and Bond Counties, Illinois, pages 210-212.